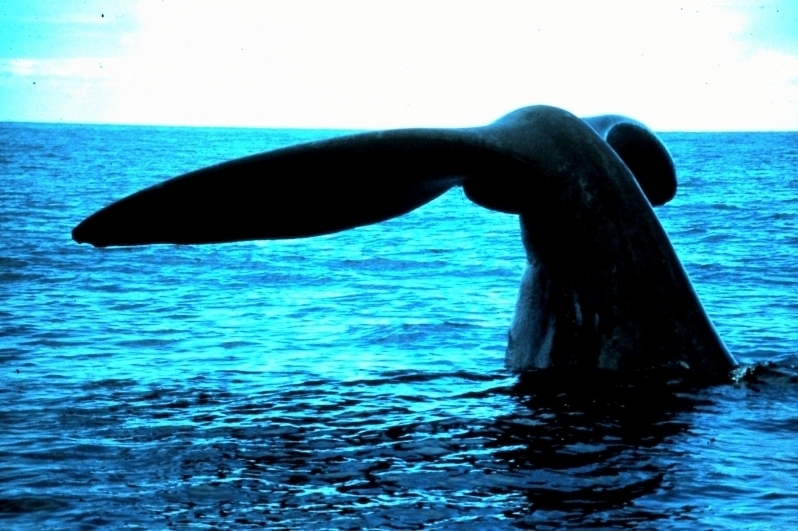 The Bowhead Whale has a large, bow-shaped head that is up to 40% of its body length and gets its name from the strange shape of its mouth. 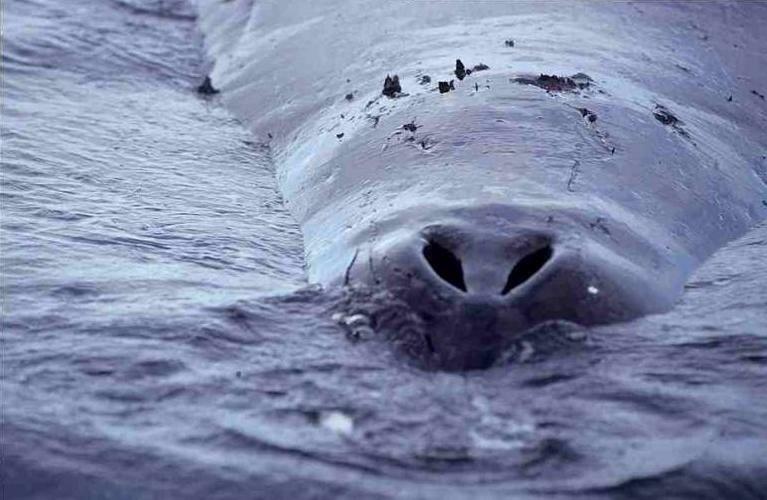 The curves of their lips & jaw are shaped like an archer’s bow. 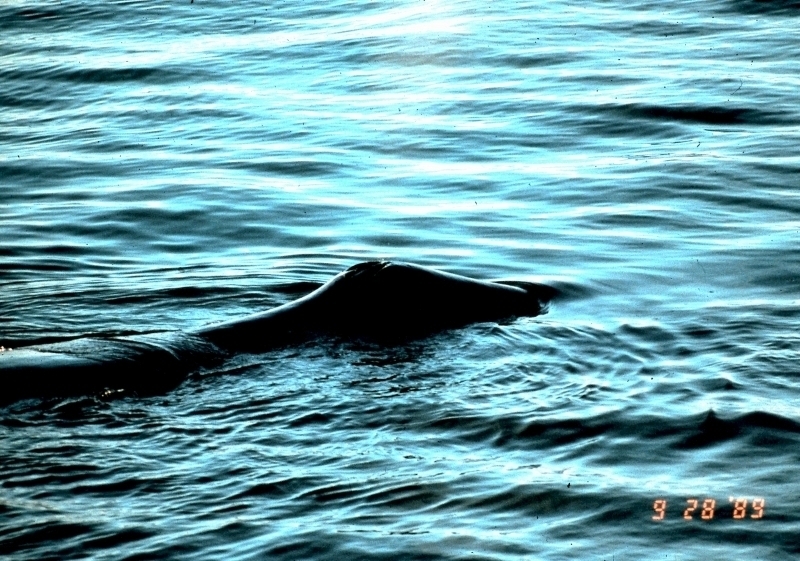 The arched mouth is up to 10 feet wide and 20 feet deep. 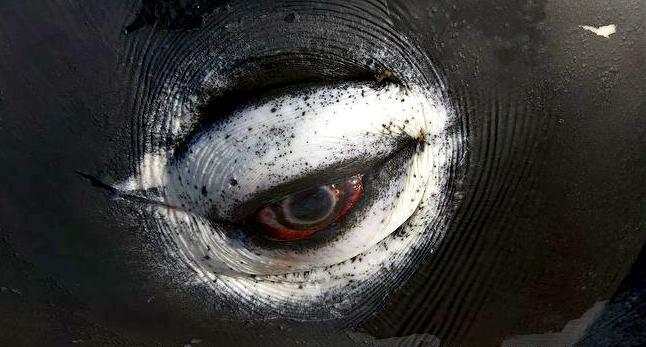 The eyes are very small and lips are huge. 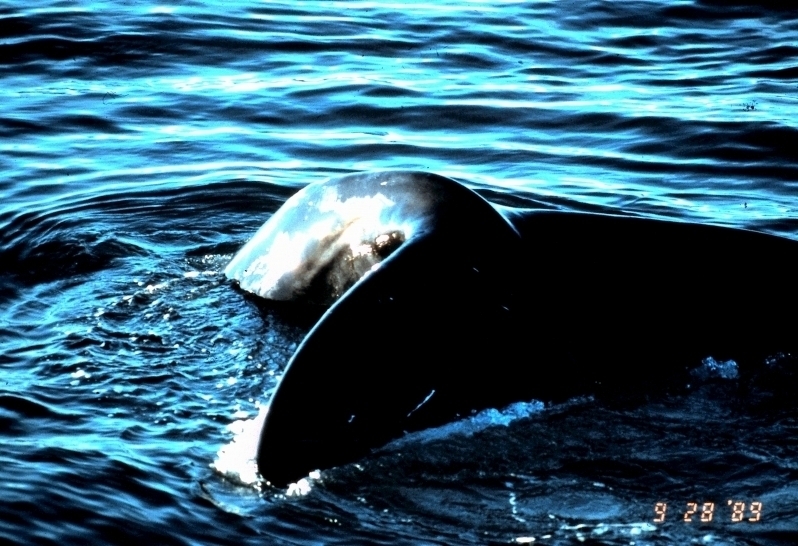 Bowheads live in pods, are rich in blubber, a subcutaneous layer 20-inch thick in places and have 2 blowholes. 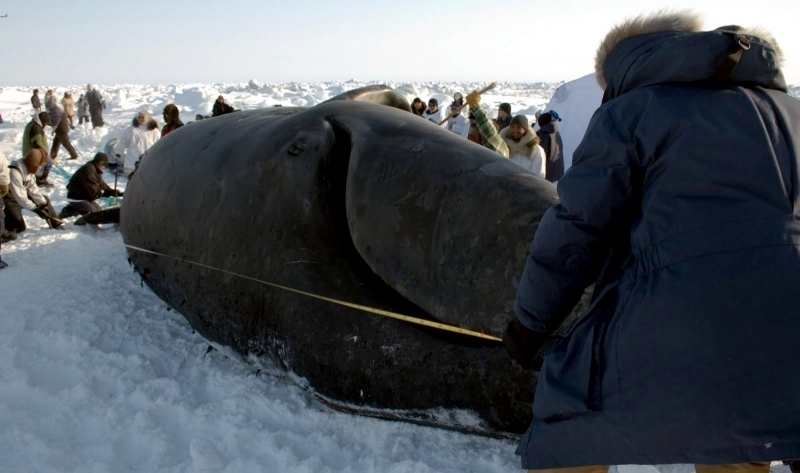 Bowhead Whales grow to be about 50-60 feet long, weighing over 80-110 tons. 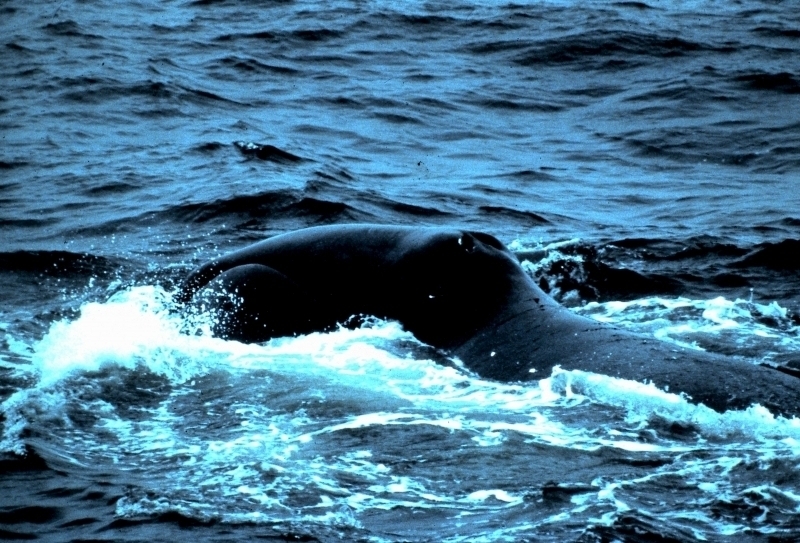 The females are slightly larger than males as with all baleen whales. 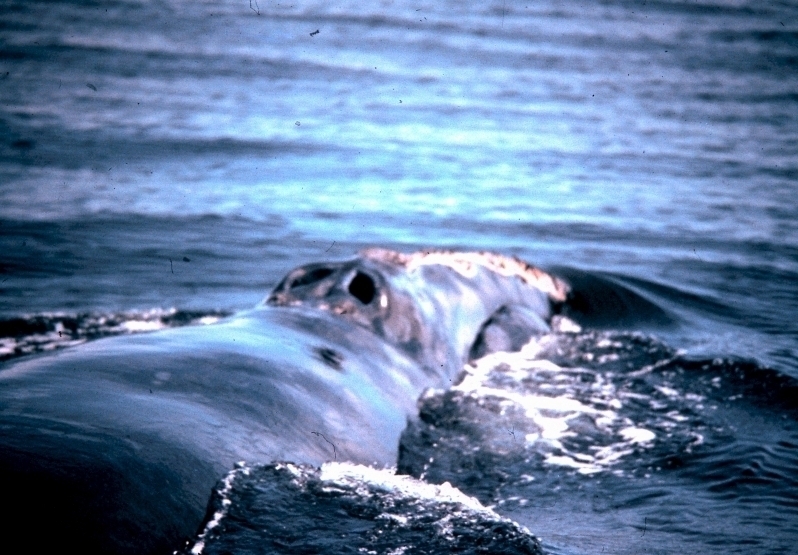 The Bowhead’s skin is usually black with a white spot on the lower snout. 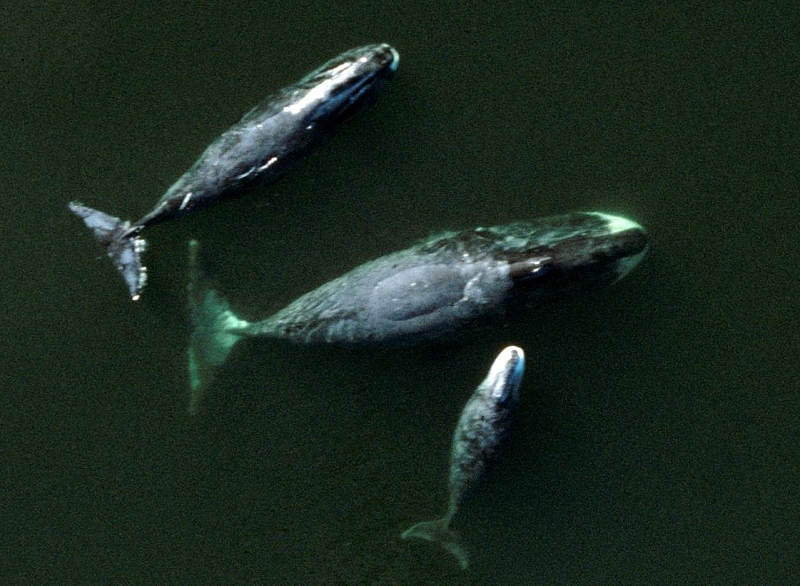 Calves are blue to gray colored. 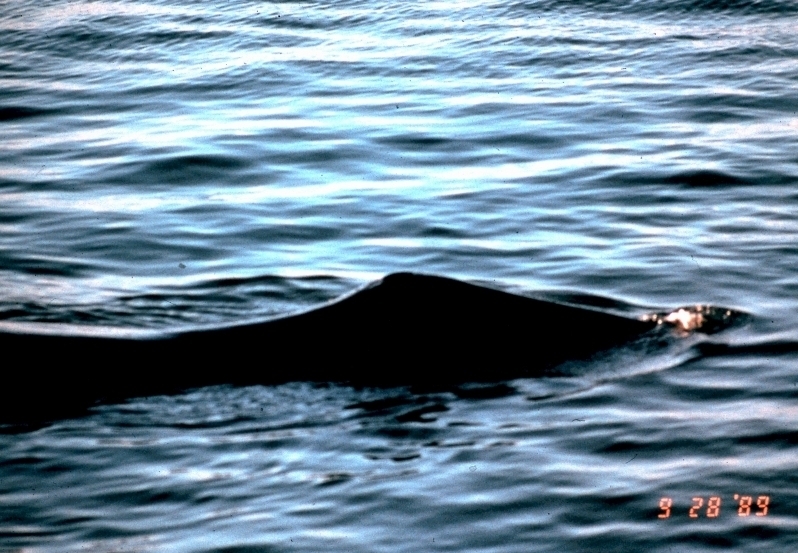 Bowheads have no dorsal fin and no throat grooves. 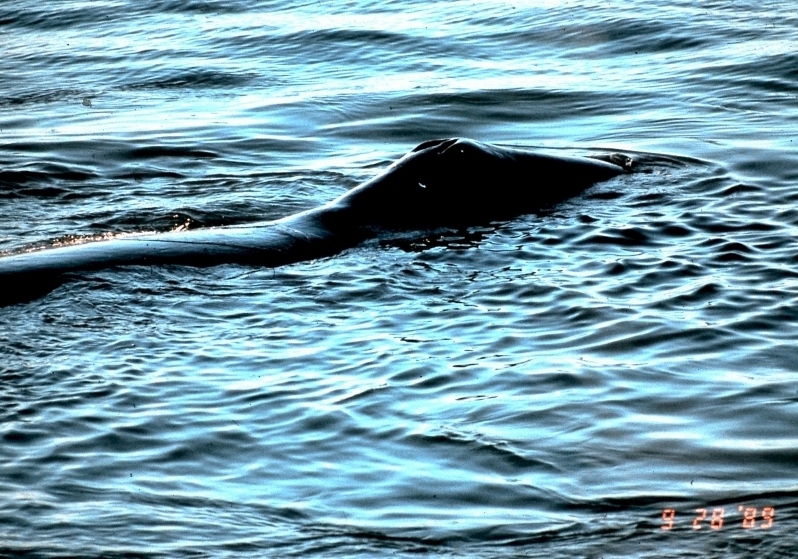 They have short, narrow flippers; the flukes are 27 feet wide. 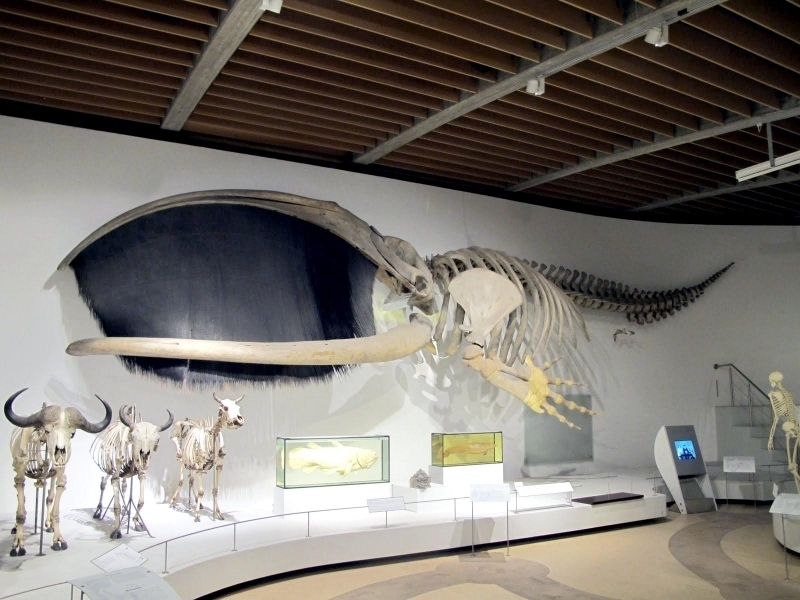 Bowhead Whales like all baleen whales, are seasonal feeders and carnivores that filter feed plankton & tiny crustaceans like krill, copepods, pteropods from the water. 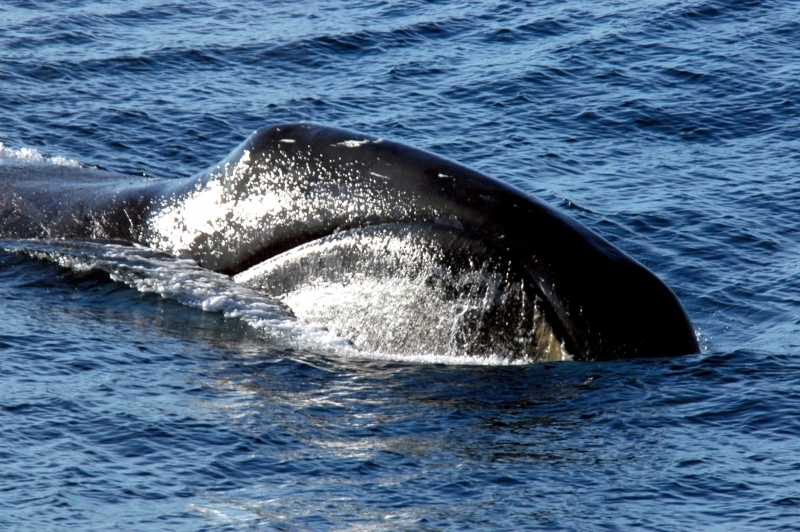 Bowheads are skimmers, filter feeders that swim slowly with their mouth open constantly eating. 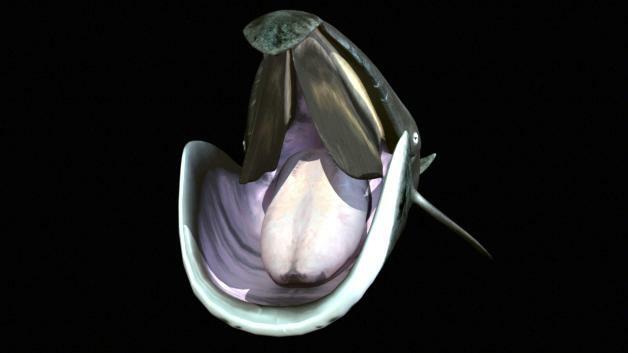 On occasion, they are also bottom feeders, eating benthic prey from the mud on the ocean floor. 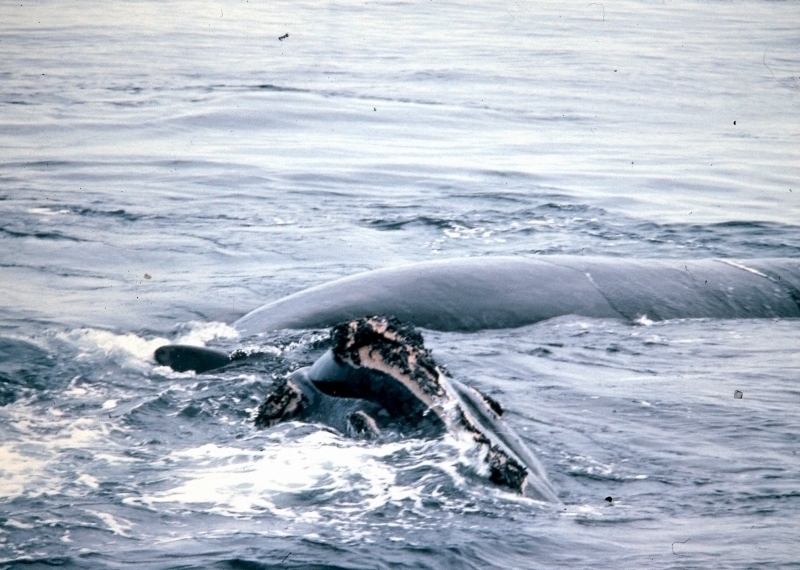 The fine baleen hairs can filter out very tiny prey including copepods, steropods, euphasids and mysids (tiny crustaceans). 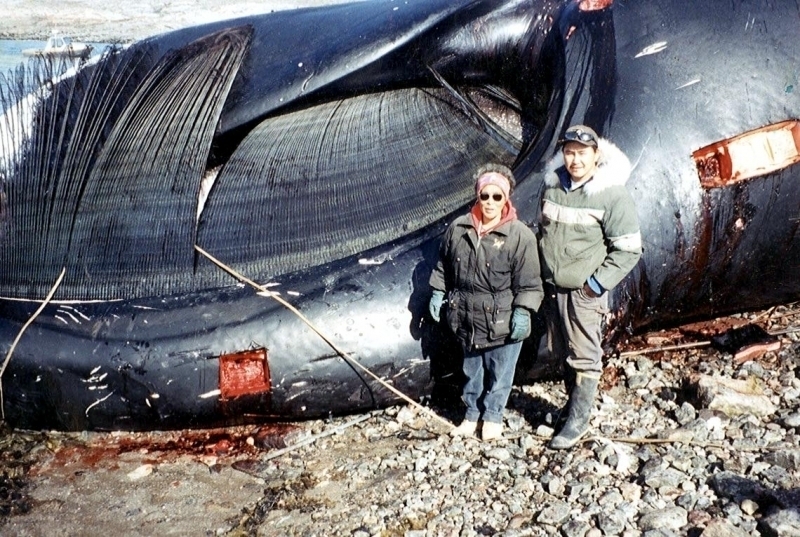 The Bowhead Whale has about 350 pairs of black baleen plates with silver-colored bristles hanging from the jaws. 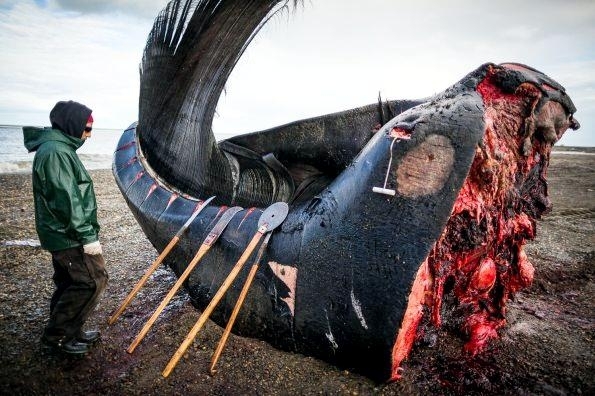 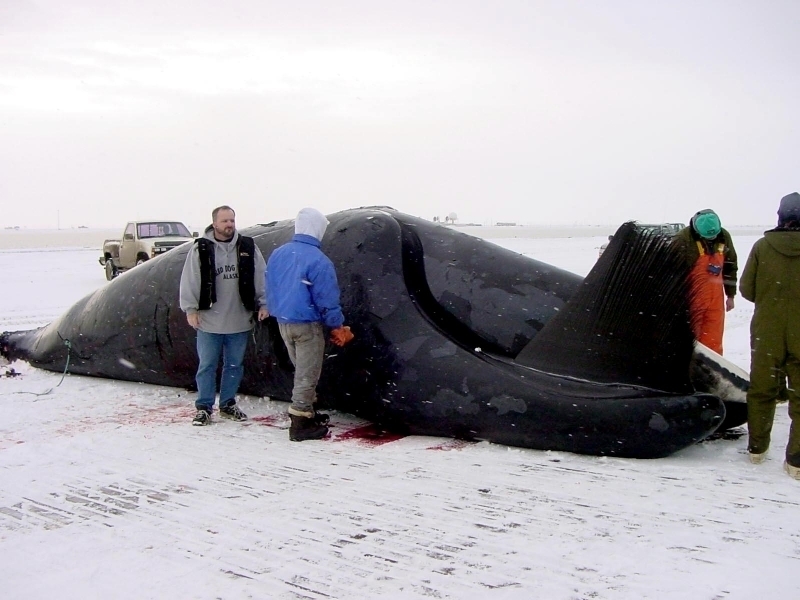 The baleen is the longest of any whale and very fine; baleen plates are about 175.5 inches long and 14 inches wide. 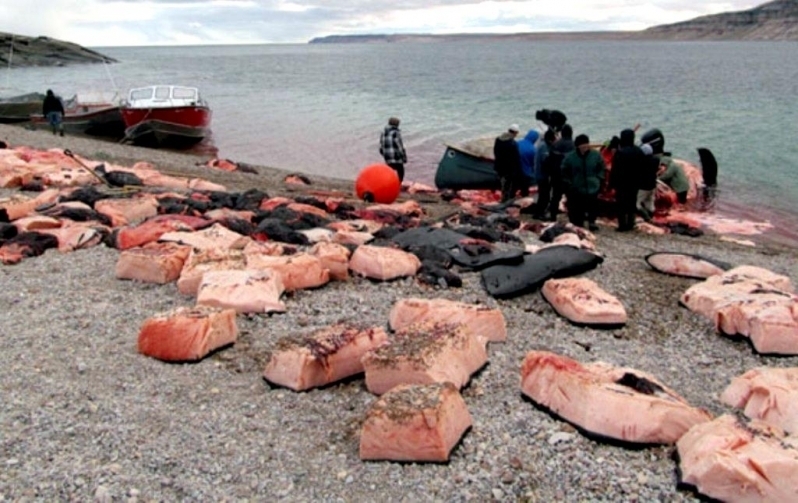 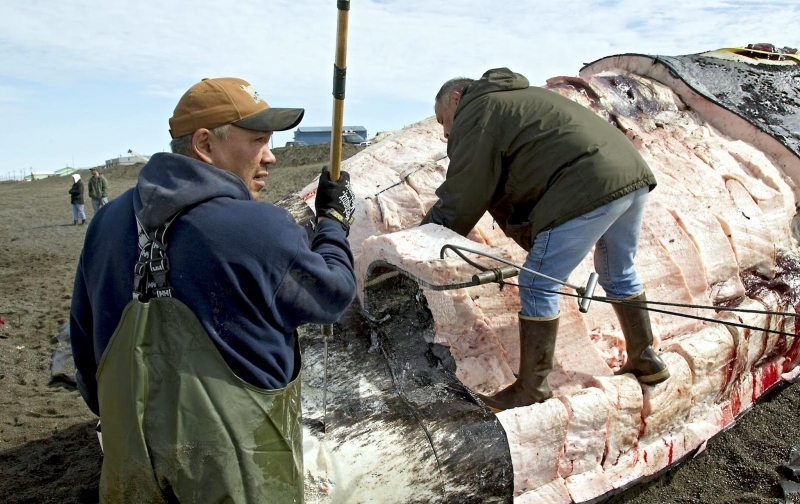 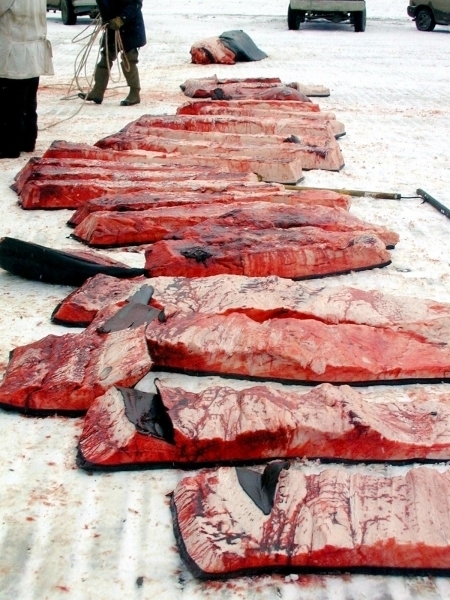 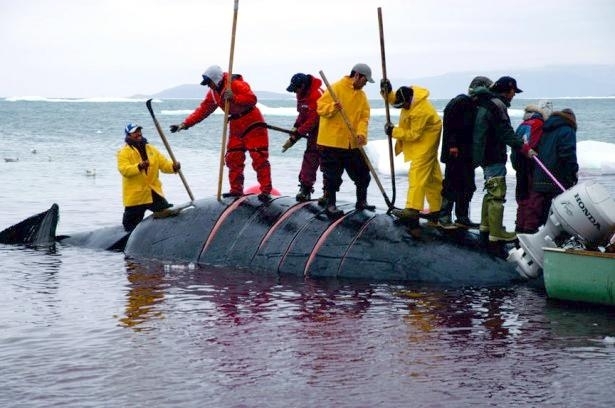 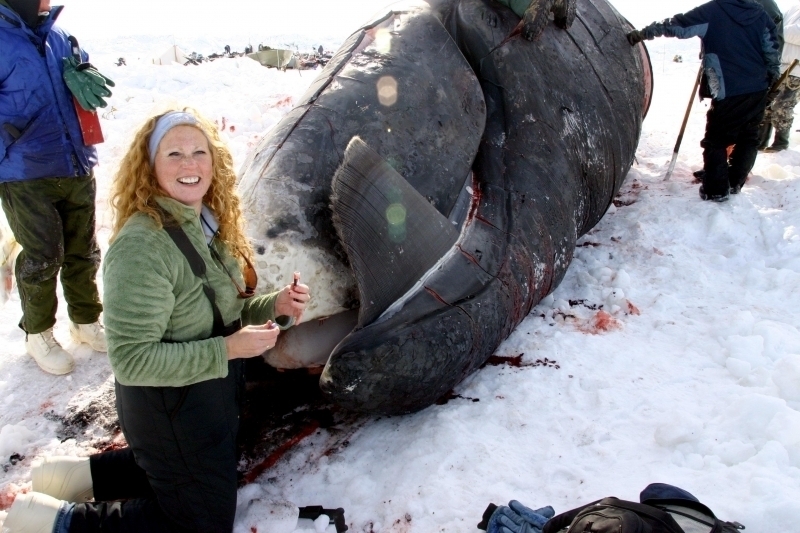 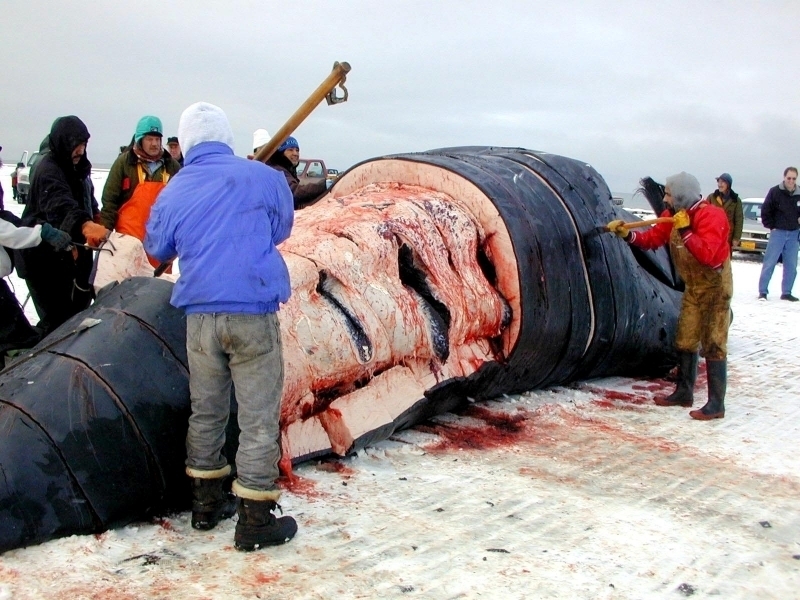 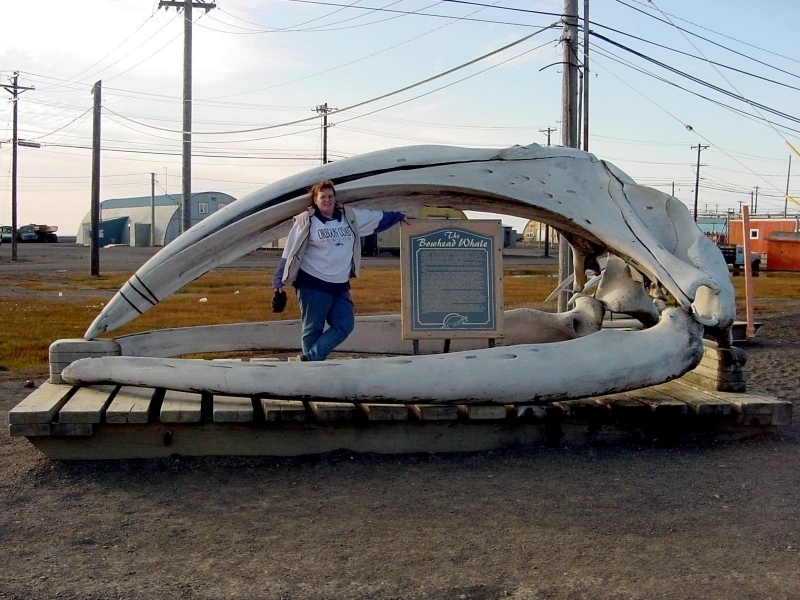 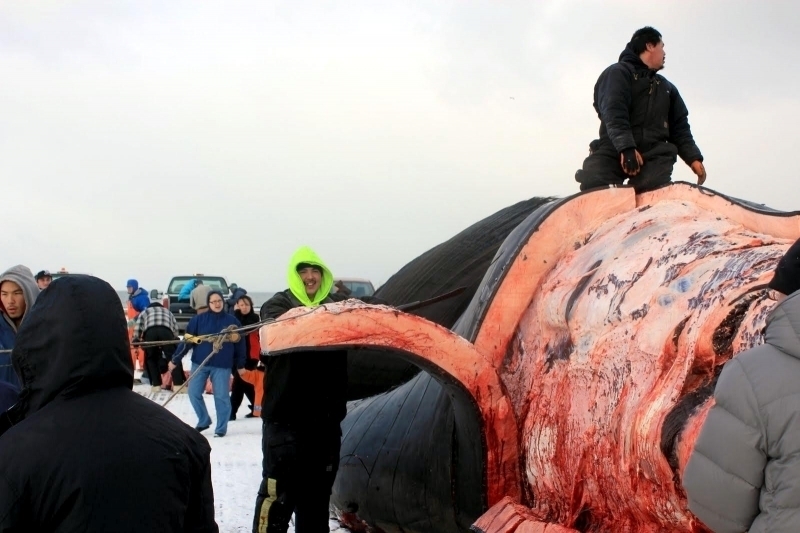 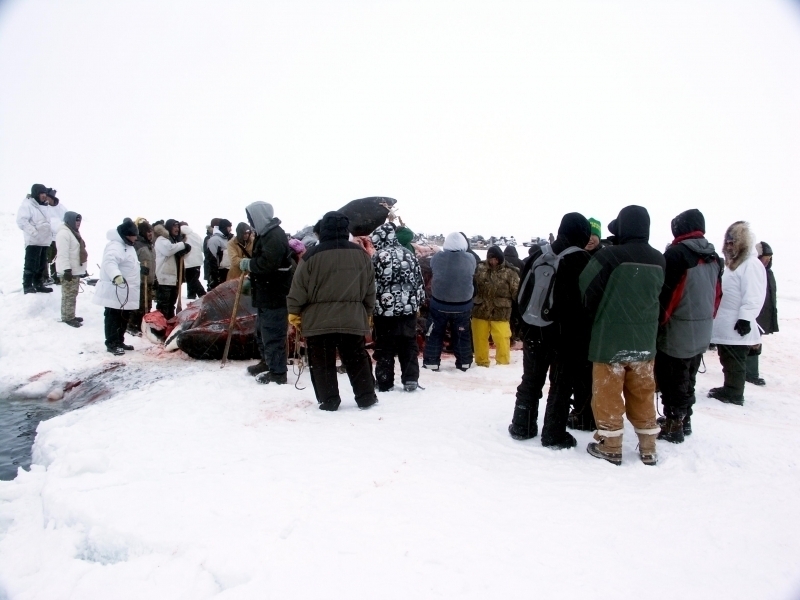 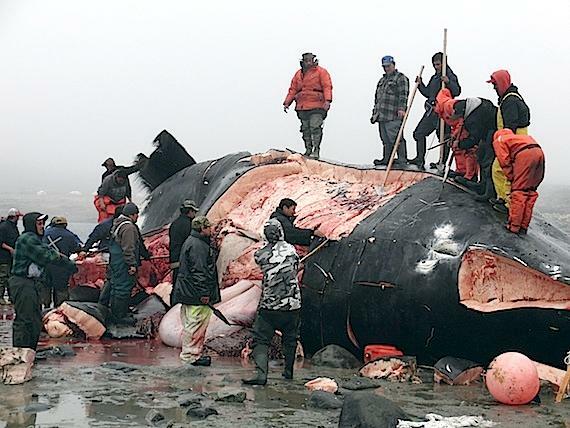 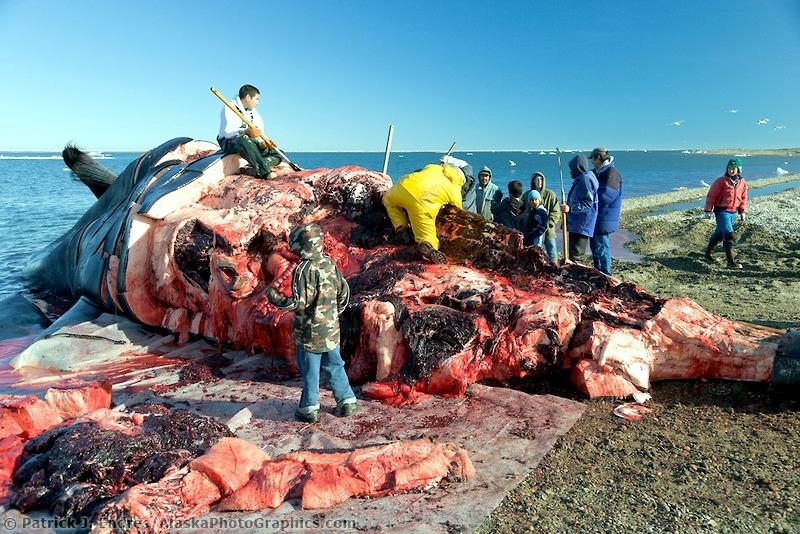 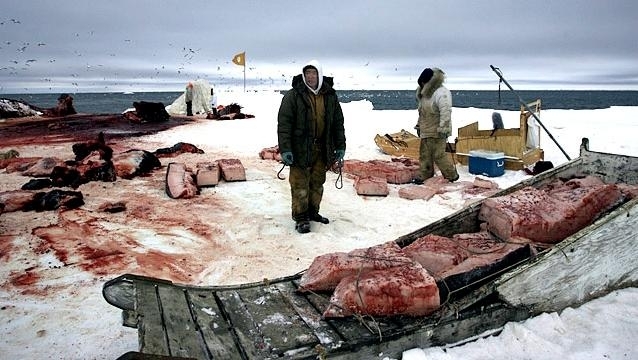 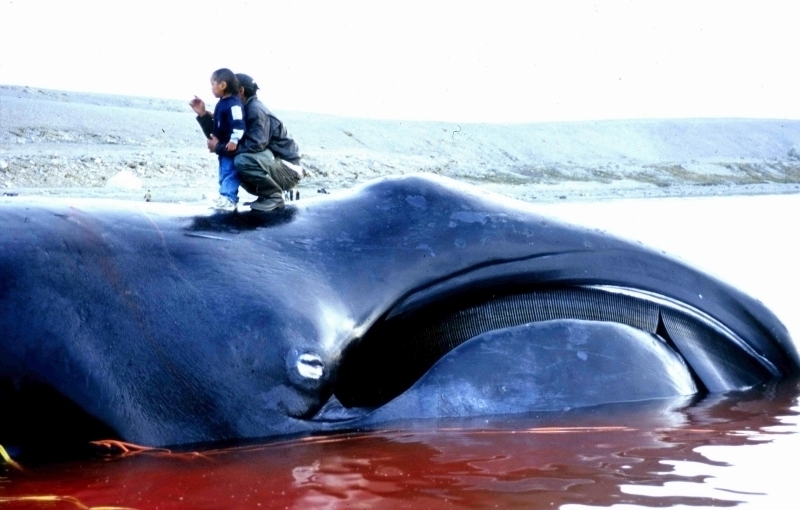 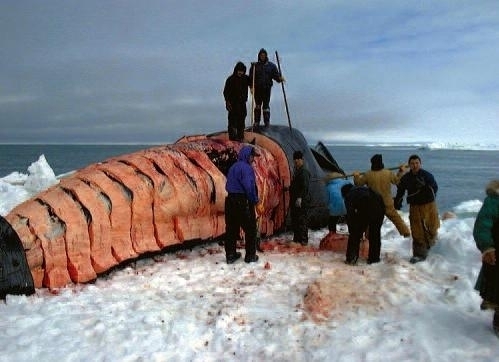 Native Eskimos still hunt these whales as well as Killer Whales are the known threats to Bowheads. 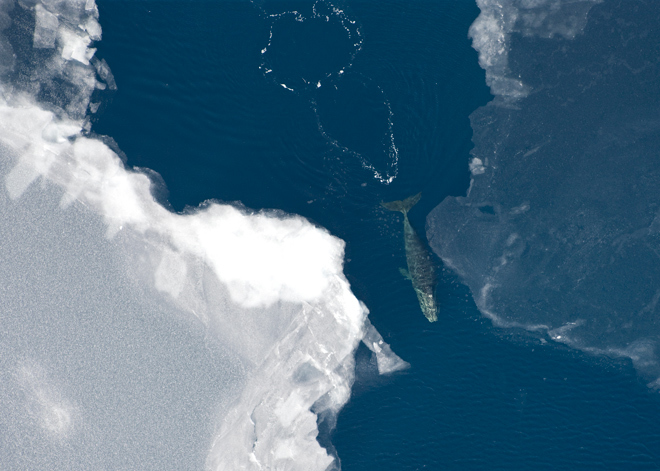 Bowhead Whales are not extremely social & congregate in small pods of about 3 whales in the spring and pods of about 50 whales in the fall. 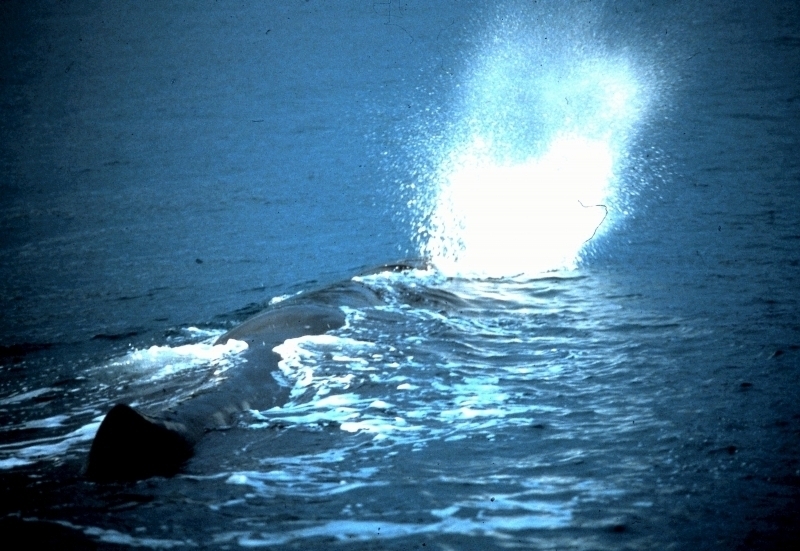 Bowheads can dive for almost an hour, but dives usually last 4-15 minutes. 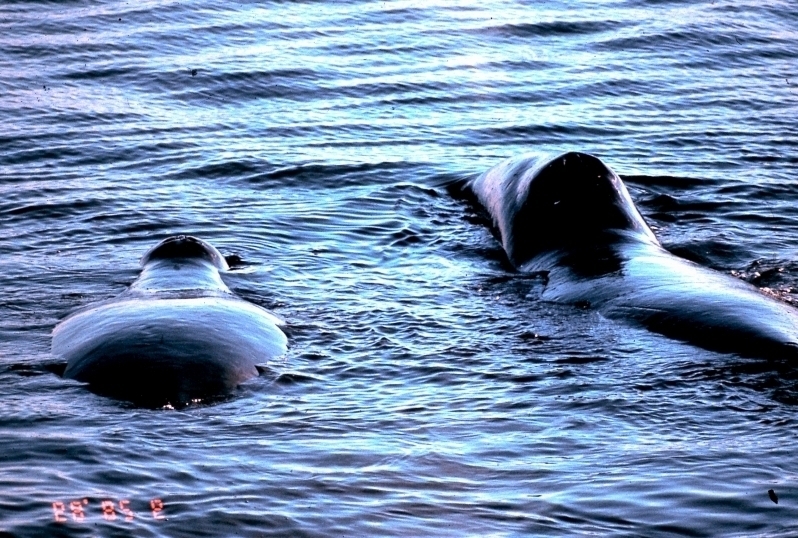 They can go to a depth of 500 feet. 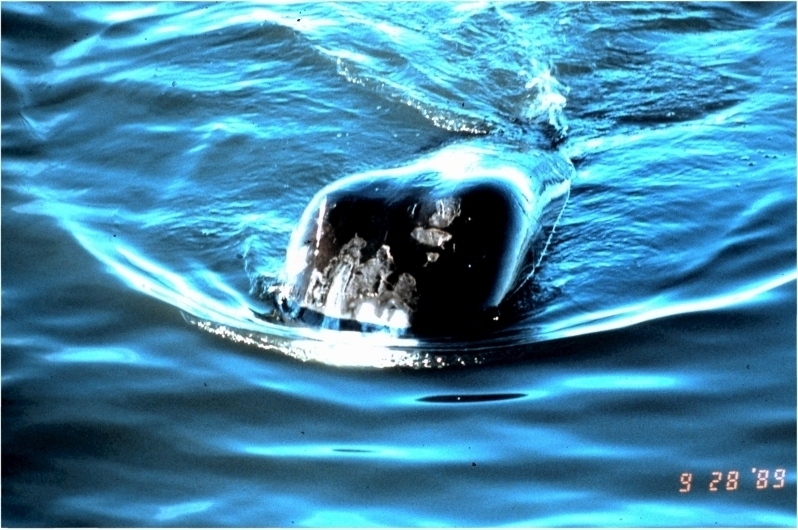 Bowhead Whales breathe air at the surface of the water through 2 blowholes located near the top of the head. 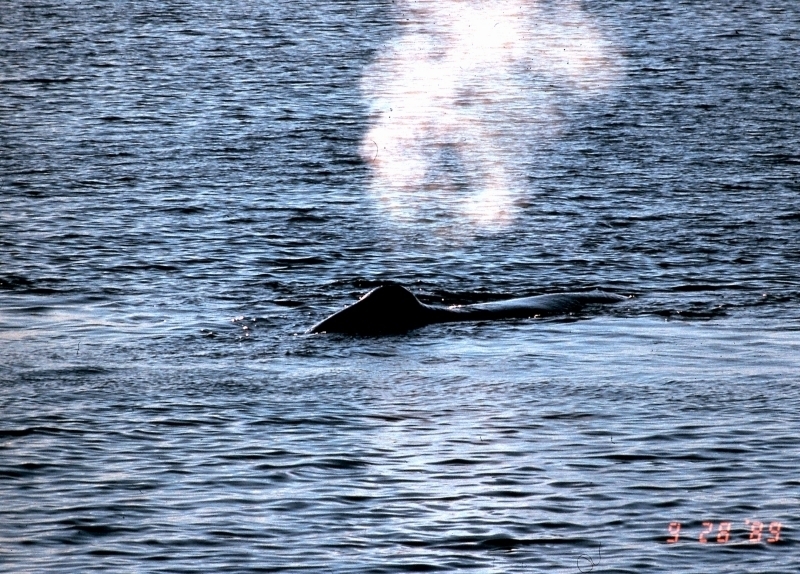 They spout (breathe) about 1-2 times per minute at rest and 4-6 times per minutes to prepare for a dive. 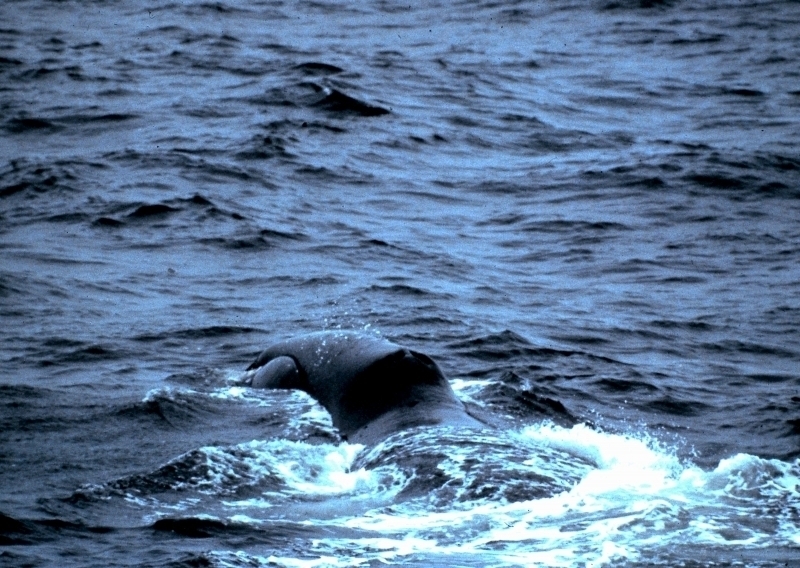 Their blow is bushy and rises in 2 cloudy masses 20 feet above the surface of the water. 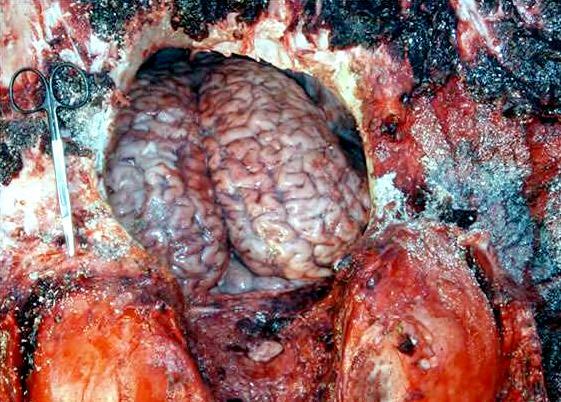 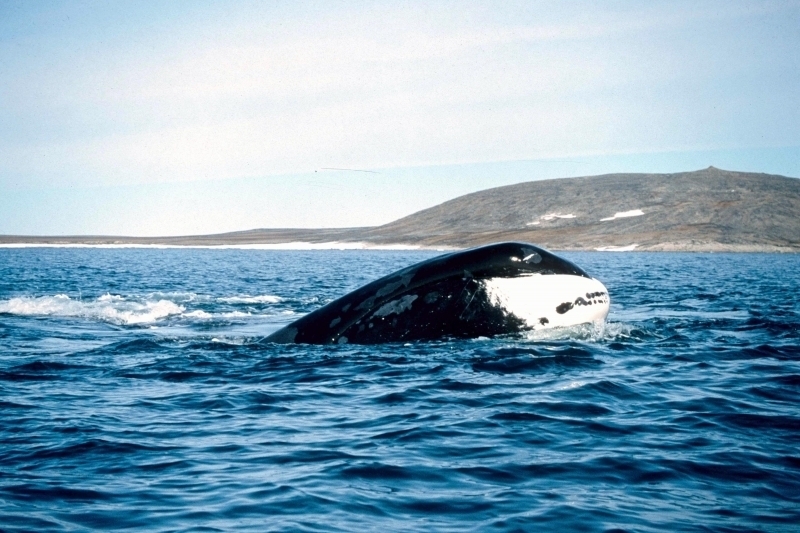 Bowheads can break through surface ice less than 1 foot thick in order to breathe. 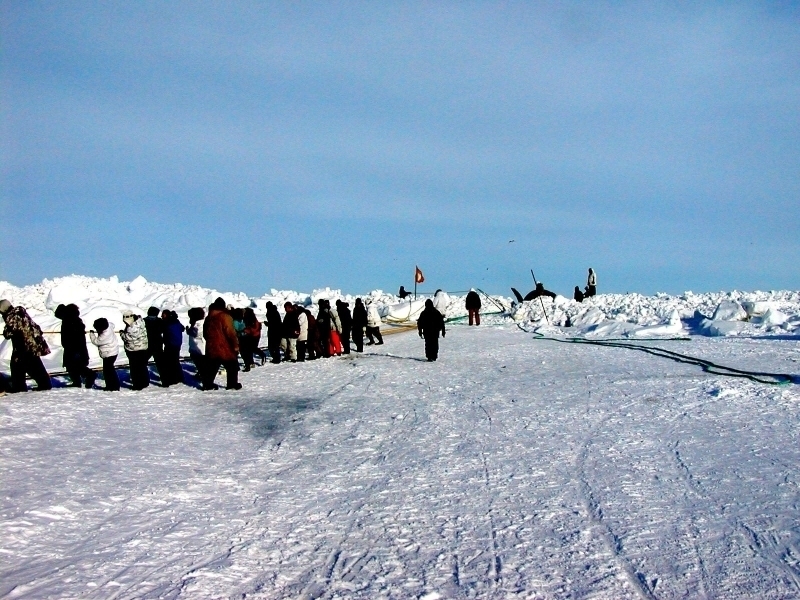 They may use echolocation to determine the thickness of the ice. 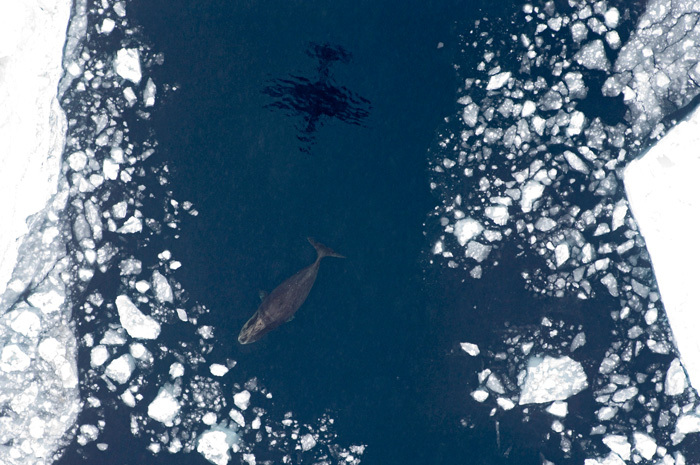 Bowhead Whales normally swim at 2-7 mph, but can go up to 10-12 mph in short bursts when in danger. 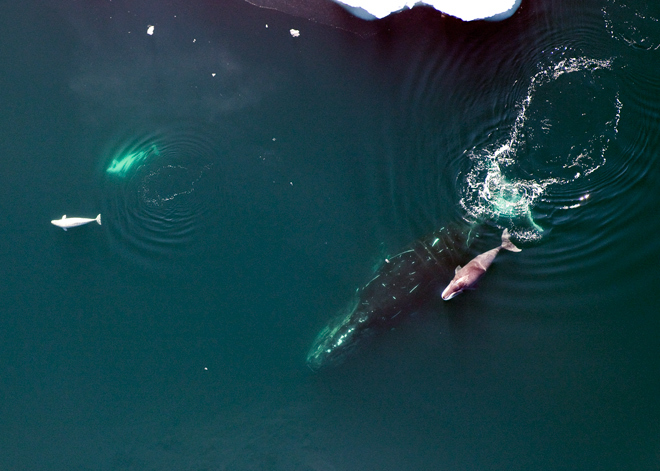 Feeding speeds are slower, about 1.2-2.5 mph. 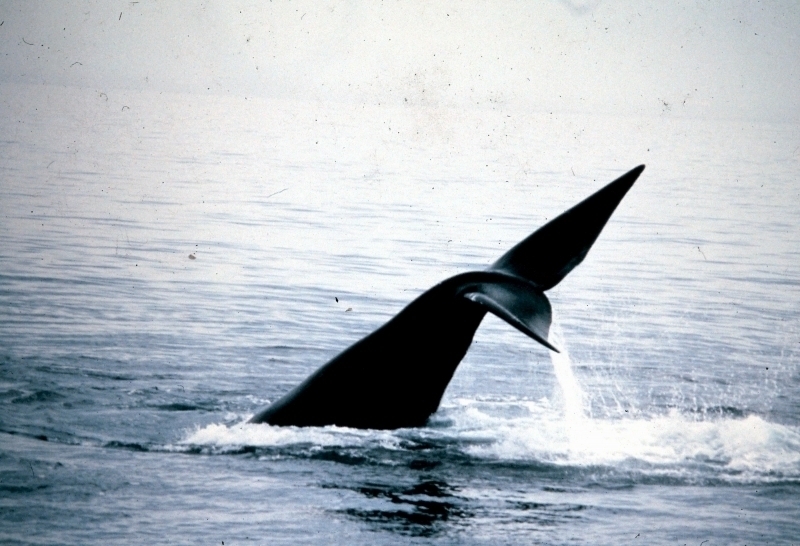 Bowheads vocalize when on migrations, mostly between the frequencies of 50-300 mg hertz. 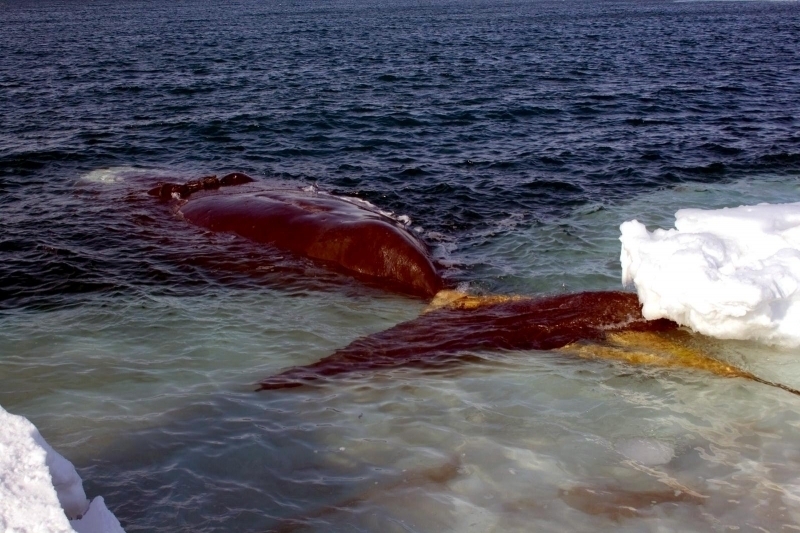 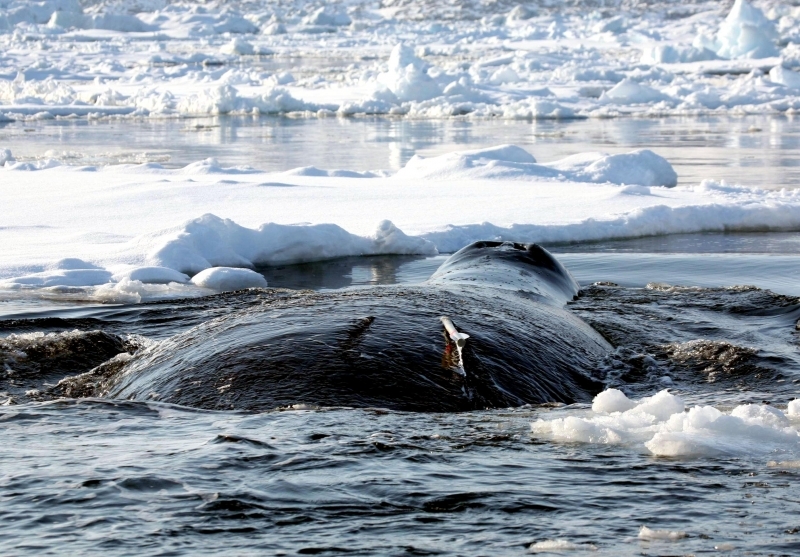 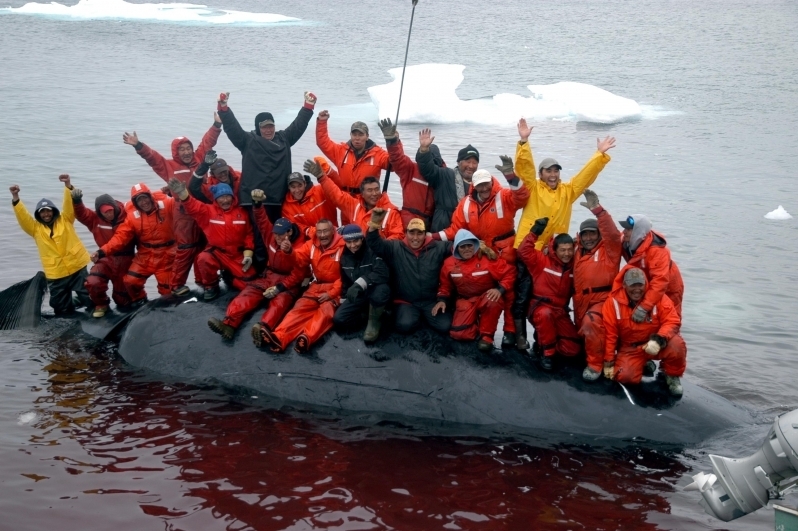 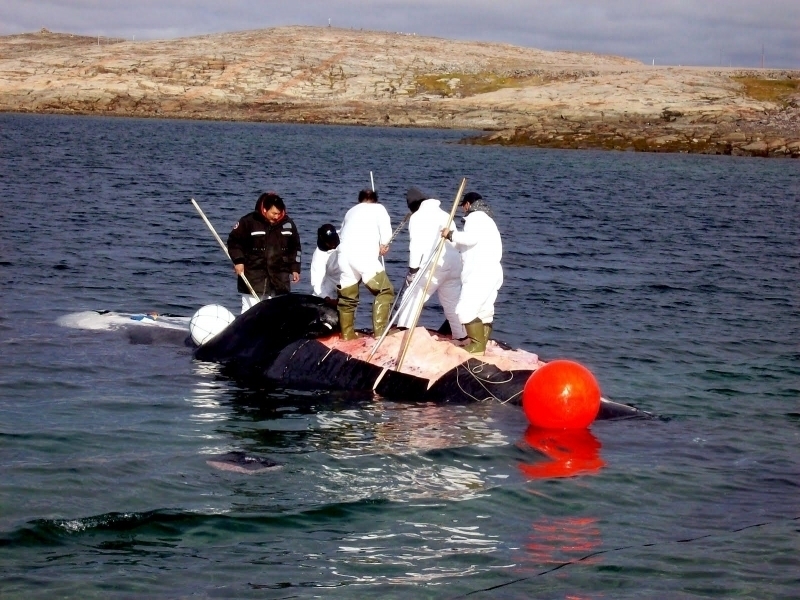 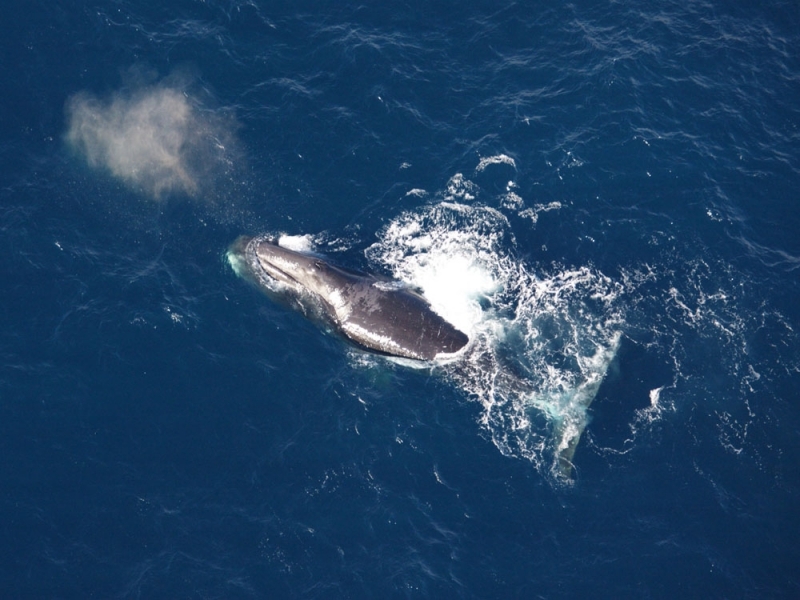 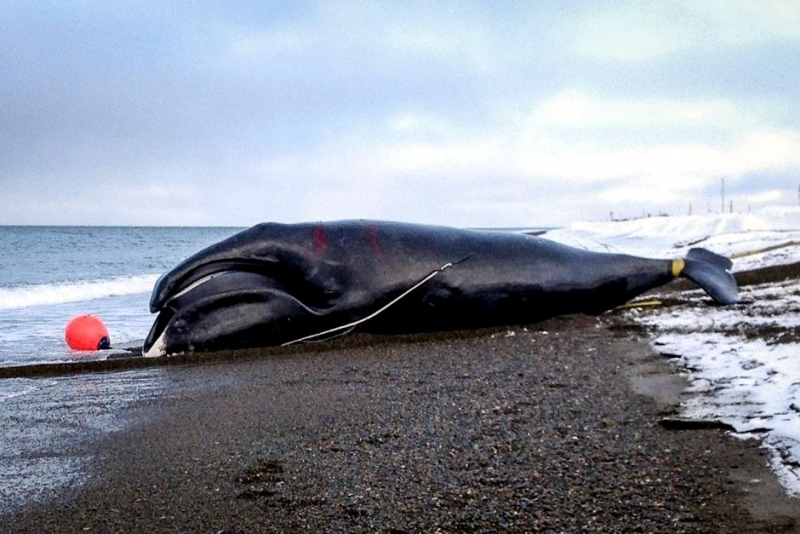 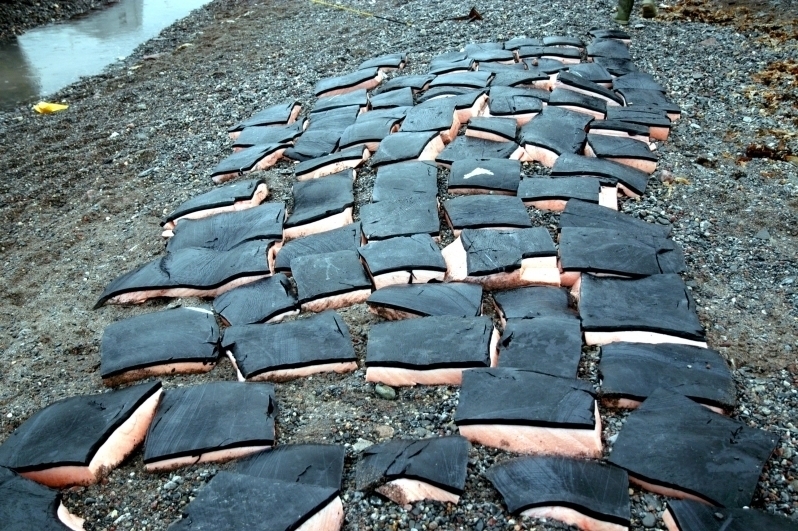 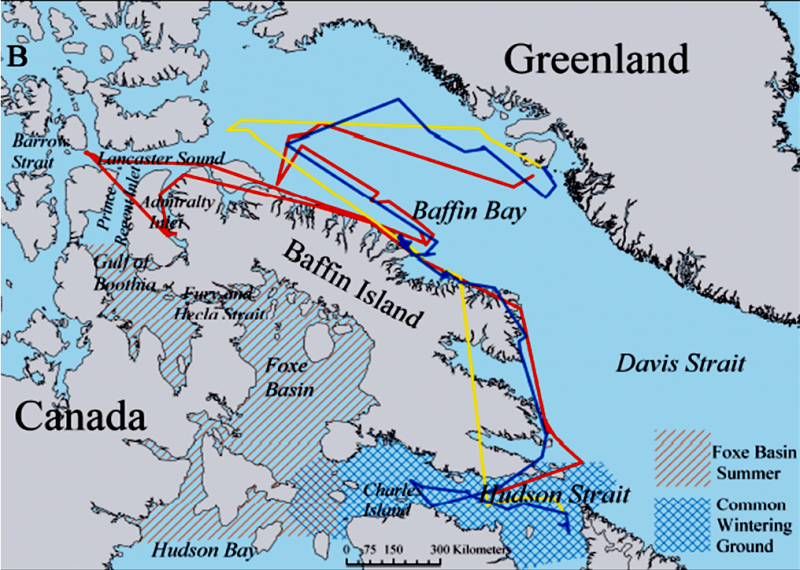 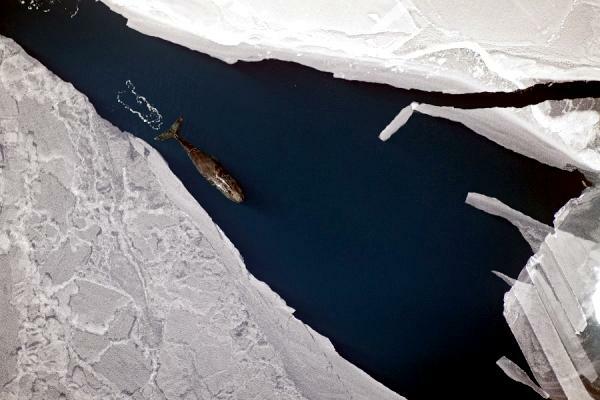 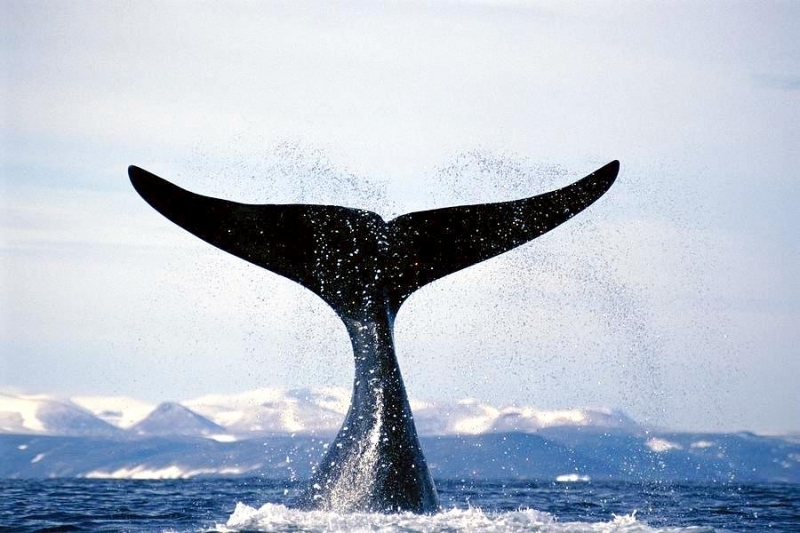 The songs may be used for locating large masses of krill and for communicating with other Bowhead Whales. 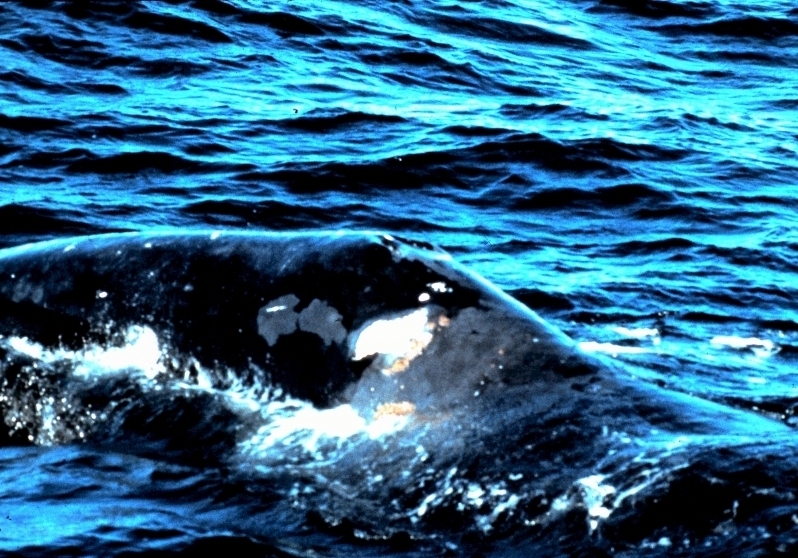 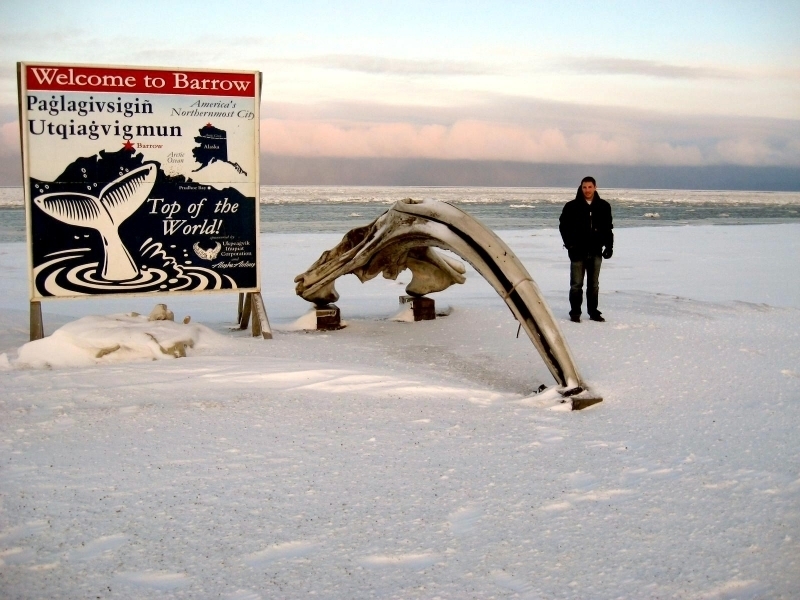 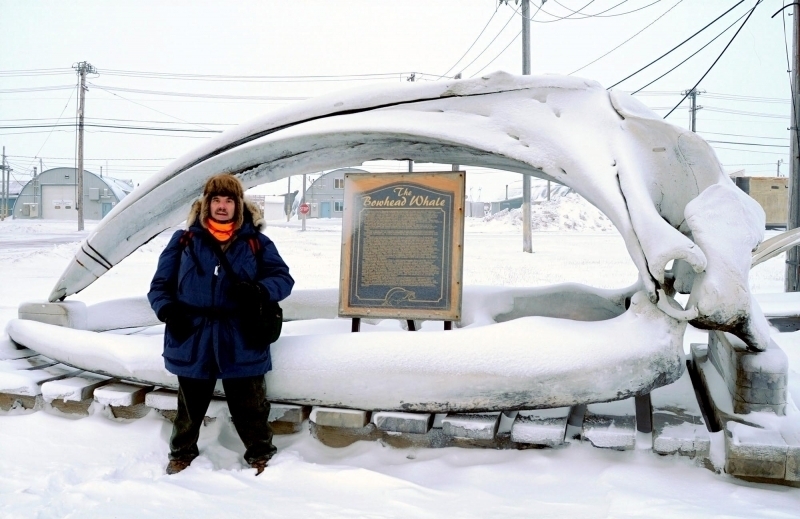 Bowheads live exclusively in the Arctic at the surface of the ocean. 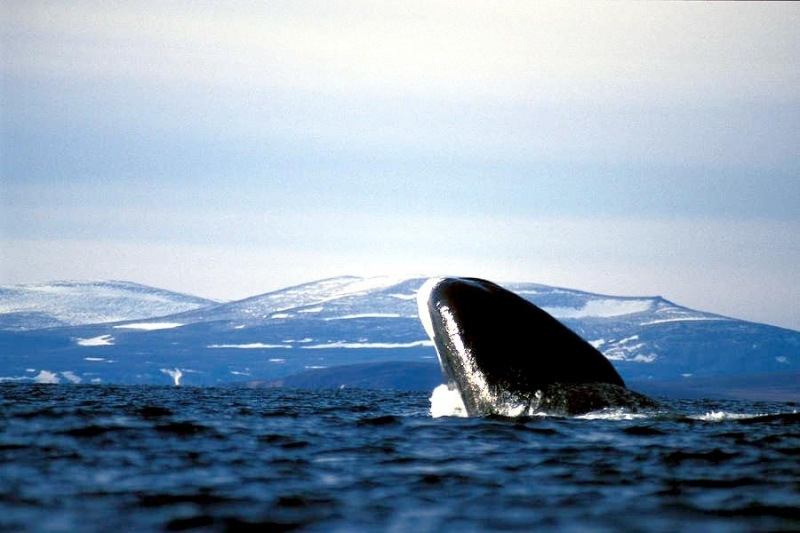 Bowhead Whales stay in the Arctic Ocean, making a northern migration in the spring to rich feeding waters. 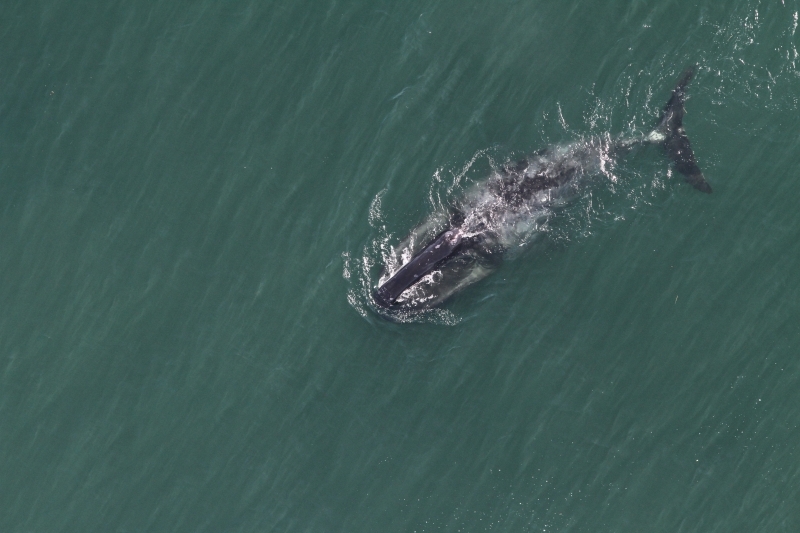 They migrate south again in the fall to breed & calve. 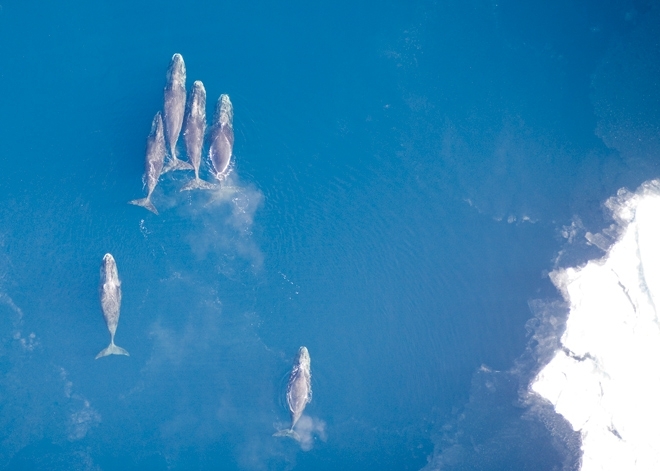 Migrating speeds range from 2-7 mph. 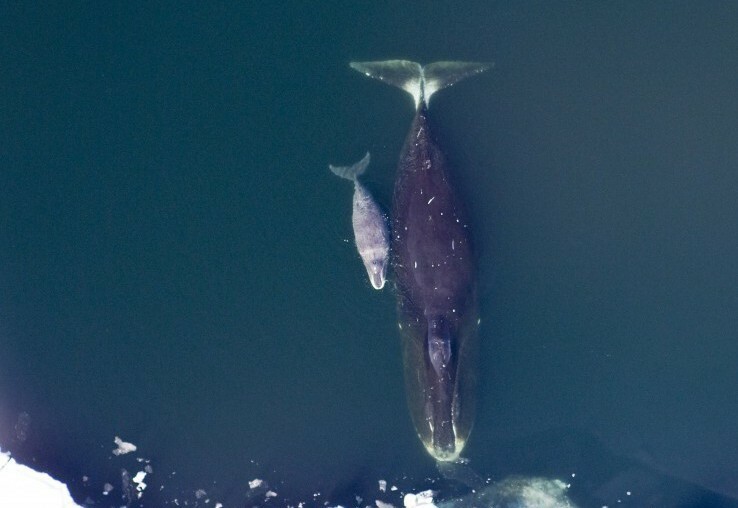 The Bowhead’s gestation period is about 12-16 months and the calf is born tail first (this is normal for cetaceans) and near the surface. 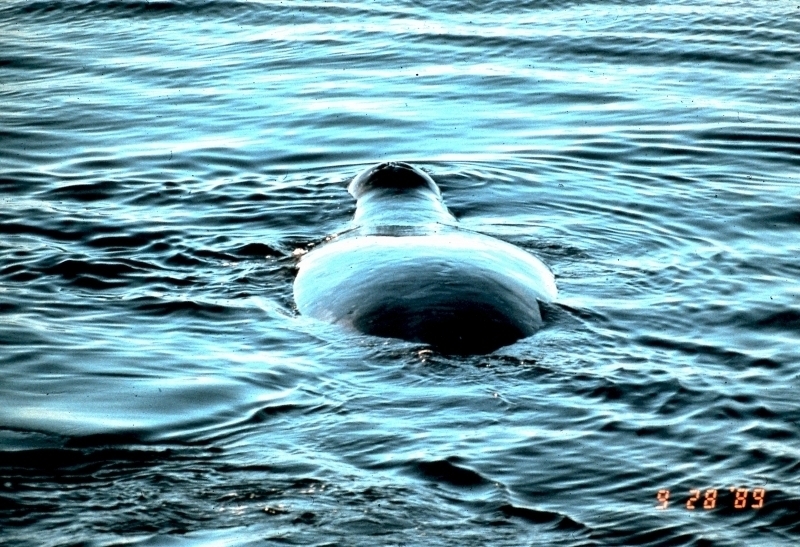 The newborn instinctively swims to the surface within 10 seconds for its first breath; it is helped by its mother using her flippers. 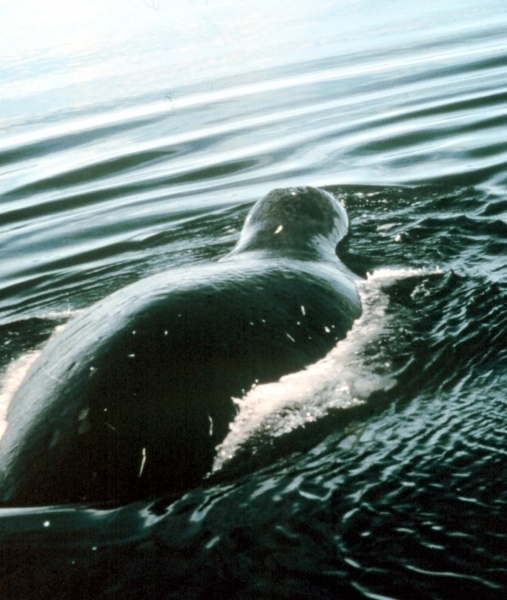 Within 30 minutes of its birth, the baby Bowhead Whale can swim. 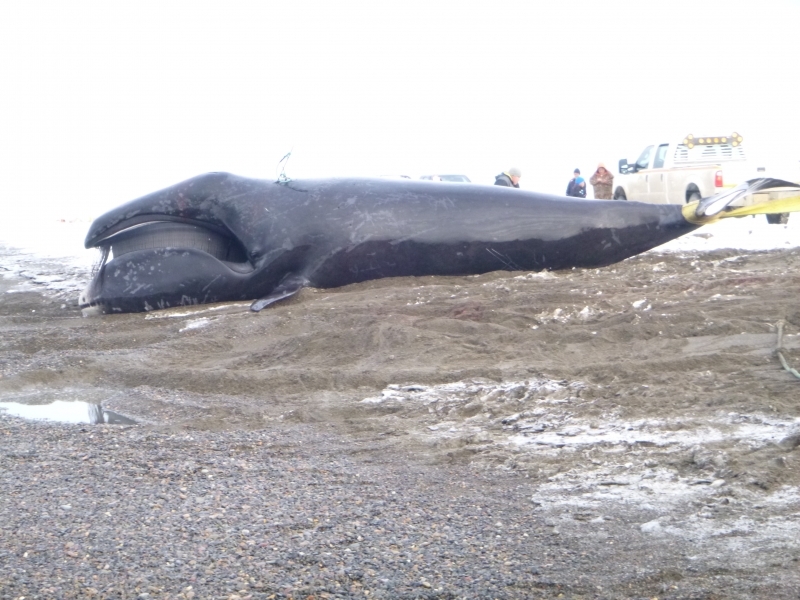 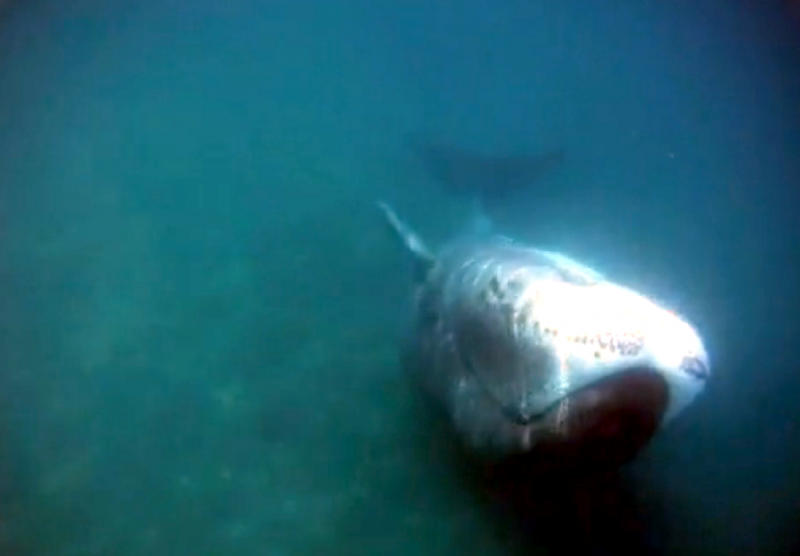 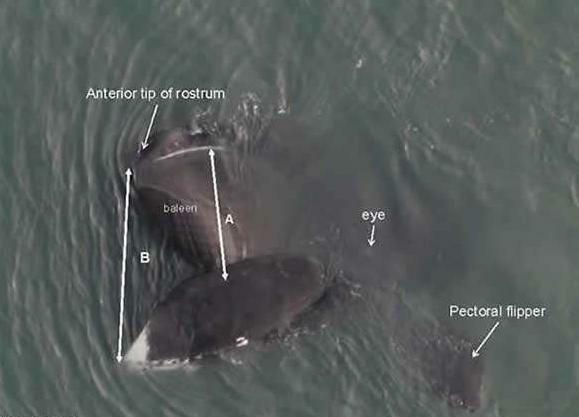 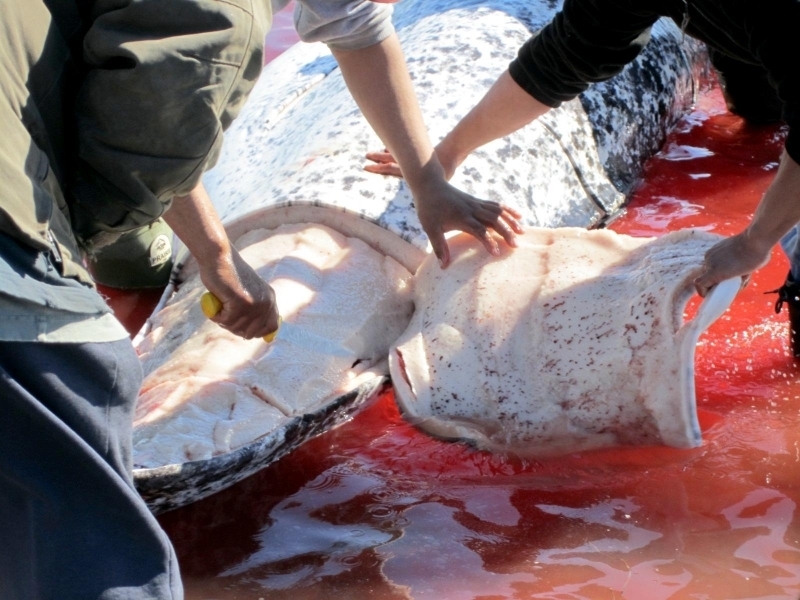 The newborn calf is about 17 feet long and weighs about 5-6 tons. 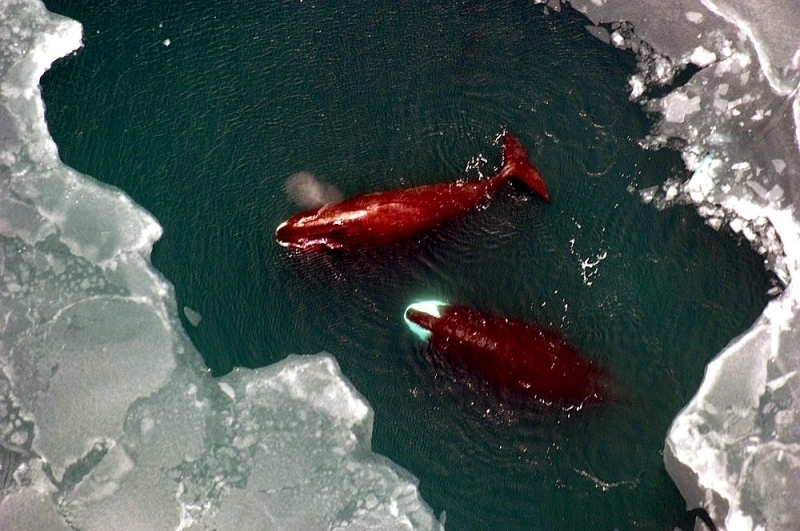 Twins are rare; there is usually 1 calf. 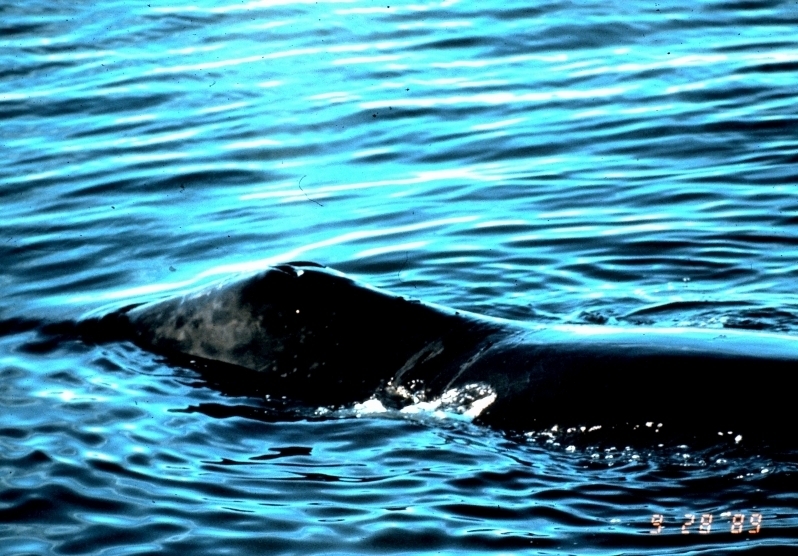 The baby is nurtured with its mother’s milk and is weaned in about 1 year. 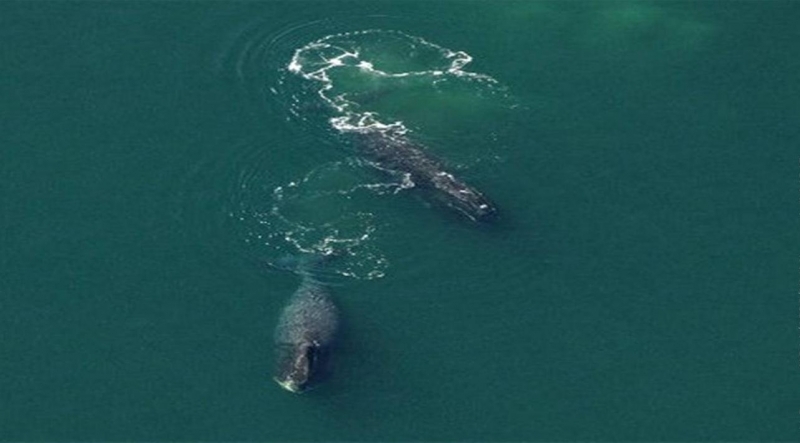 The mother & calf may stay together for a year or longer. 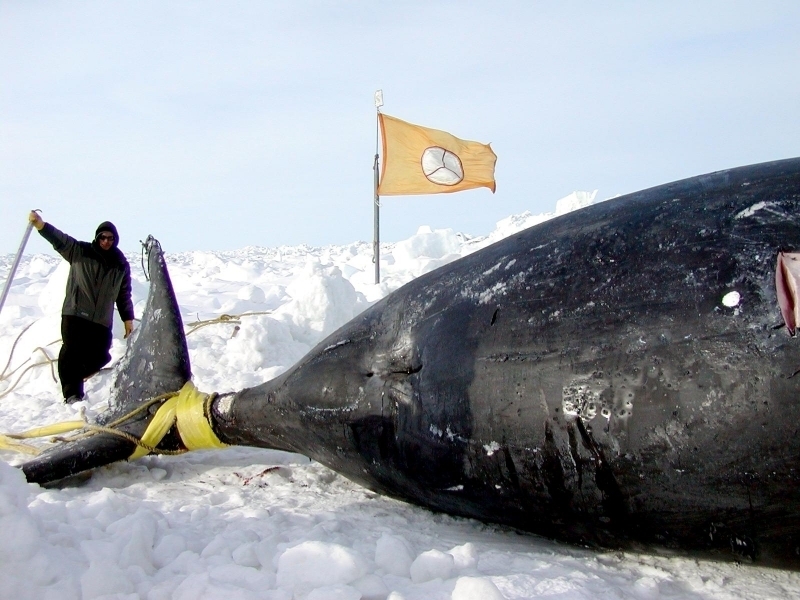 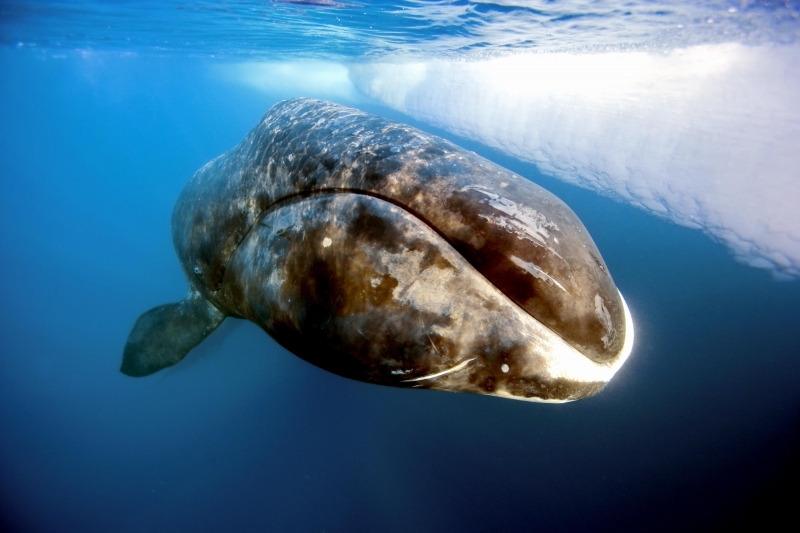 Bowhead Whales reach puberty at 6 years and have a life expectancy of at least 40 years. 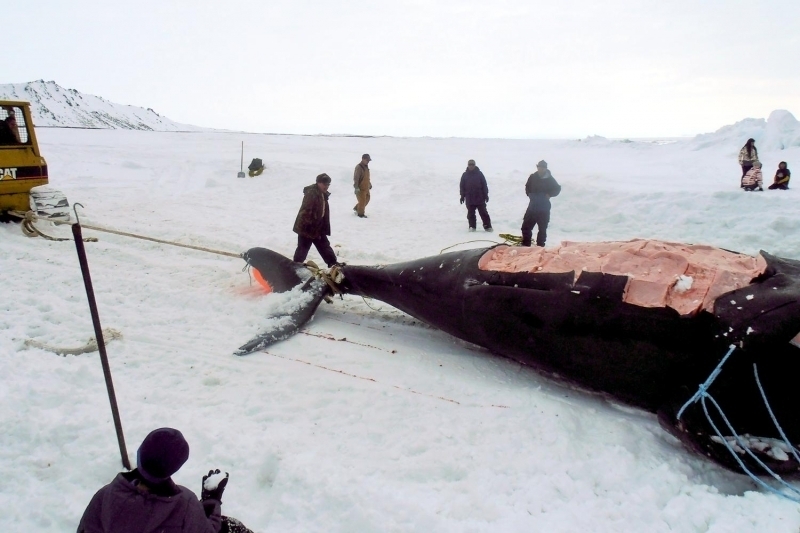 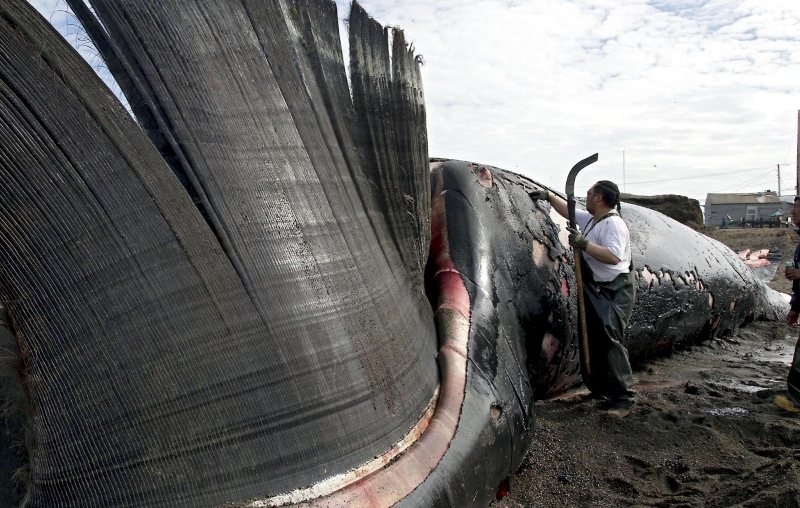 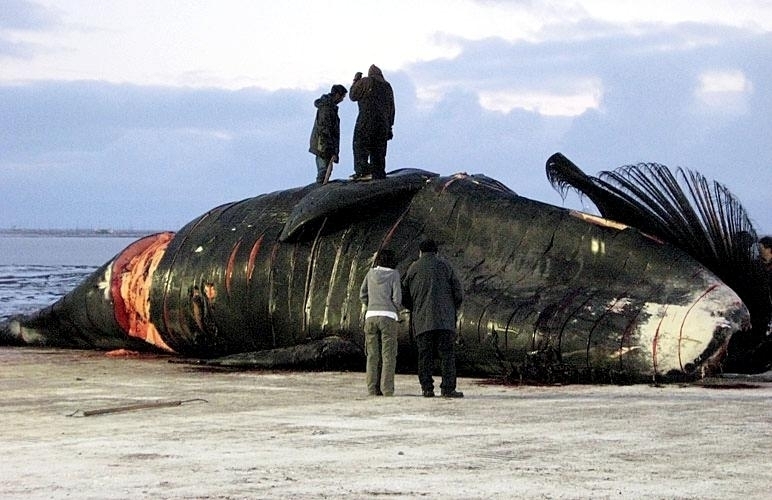 It is estimated that there are about 8,000-12,000 Bowhead Whales world-wide and they are an endangered species.